Independent film scored a pretty big win this year when Richard Linklater’s Boyhood dominated awards season. Still most independently funded films are not fortunate enough to get the exposure that Boyhood received. Thank goodness for film festivals! This week, the Capital City Film Festival in Lansing, Michigan will be featuring a heart warming and sweet documentary called Welcome to Unity, which just so happens to share some of the thematic magic that helped make Boyhood the beautiful film that it became. 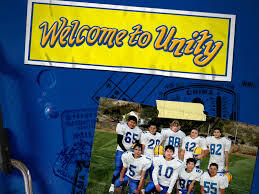 Welcome to Unity follows a group of seven foreign exchange students from various European and Asian countries as they adjust to American life in the tiny rural town of Unity, Oregon. The film was mostly shot by the exchange students who were given Flip cameras to document their school year in their new surroundings. I was fortunate to attend the Michigan premier of this film with the student Movie Club that I sponsor. We all appreciated the warm- hearted nature of the film and like Boyhood, the film truly resonates with both adults and high school aged kids. Director, Katharine Mahalic will be in attendance at the festival when her film screens at 6:00 PM, April 10 at the Knapp’s Center, 300 Washington Square in Lansing, MI. For more info visit http://capitalcityfilmfest.com/event/welcome-to-unity. 2015 CCFF Teaser from Lansing Public Media on Vimeo. So neat that this film is in the festival! I know! It’s the little movie that could!